I have increased the whole grain flour to a total of 30% of the total flour by adding 10% Kamut. I have increased the final dough hydration to 75%. Note: I have maintained my 50% hydration starter with feedings as previously described – a bit of rye and the remainder high-protein flour – with feedings about 3 times per week. Tasting notes: It was severely yummy. I divided the dough from this mix into 3 loaves. I baked two after 24 hours cold retardation. One went to a neighbor. The third loaf was baked after 40 hours cold retardation. It has a more open crumb than the one pictured above, and the flavor is significantly more sour. Good looking bread as always. I have started to use a Bosch Universal Plus mixer for my doughs after being a dedicated hand mixer. 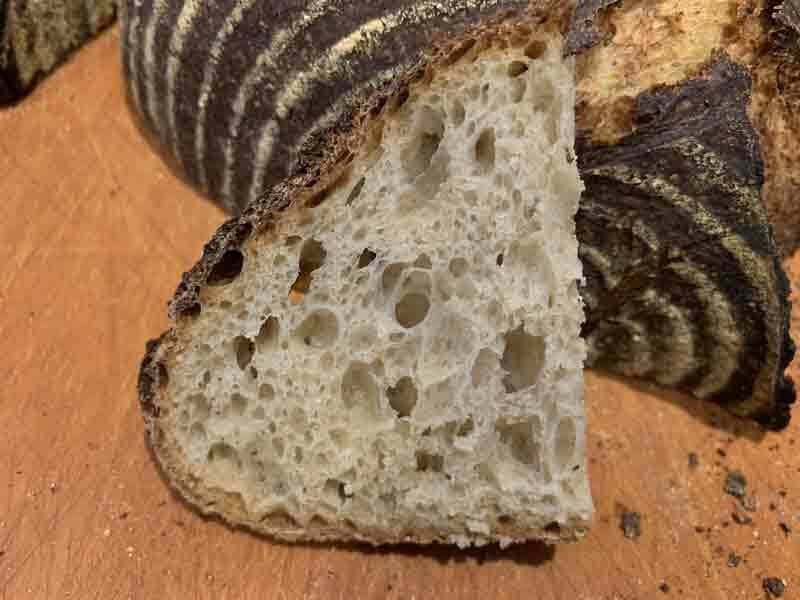 My breads have improved mostly because of better gluten development but sometimes it seems that a shorter mix time and only on speed one for about three or four minutes seems to be enough and longer times result in a tighter crumb. I was wondering how you determined the mixing time for your excellent results? Do you go for full development and window pane. Hammelmans bread recommends a thousand revolutions in the mixer and I think the Bosch does about 130 rpms on speed one and 150 rpms on two. I find the dough gets too tight if I go that long. It wraps around the center, sticks to the bottom of the bowl and seems to be shredding. I seldom get the dough to stay on one side of the bowl to let the arms do the kneading if the it is a 70% or greater hydration. I have the plastic piece that cleans the center column but it doesn't seem to help much. That being said my loafs have more volume than hand mixing and the results are better overall if the folding and fermentation are mysteriously done correctly. I am going to try proofing before retarding to see if I can achieve your success. The mixing times for this bake were taken directly from the Mike Giraudo recipe that started me on my current string of "experiments." It seemed to give me good results, so I've stuck with it. My mix was also done in a Bosch Universal Plus. It does a great job mixing, but it is a mess to clean up when your dough is over 70% hydration. This mix developed a nice window pane. If you mix a lot longer at a higher speed, you could end up with a more closed, even crumb, paler dough and poorer flavor due to carotenoid oxidation. I've done that purposely once with a KitchenAid, just to see if I could. That was with a 100% whole wheat yeasted dough. I think I've been getting a nicer crumb with machine mixing than hand mixing, but I know one can achieve this with the right hand mixing techniques. Can you tell me how the crust was? I am very curious to know if it was thin and crisp/ crusty or thicker and crunchy / crusty.... or what? I am thinking how the rye changes the crust quality and the Maillard reaction.... so wanted to know. My 20% kamut loaves are very crisp and was wondering how adding a bit of rye would change the crust quality. Also, is your mother starter always 50%? If so is that for ease of maintenance? The crust is crunchy, and it stays pretty crunchy for a few days. This happens to be how I prefer it. 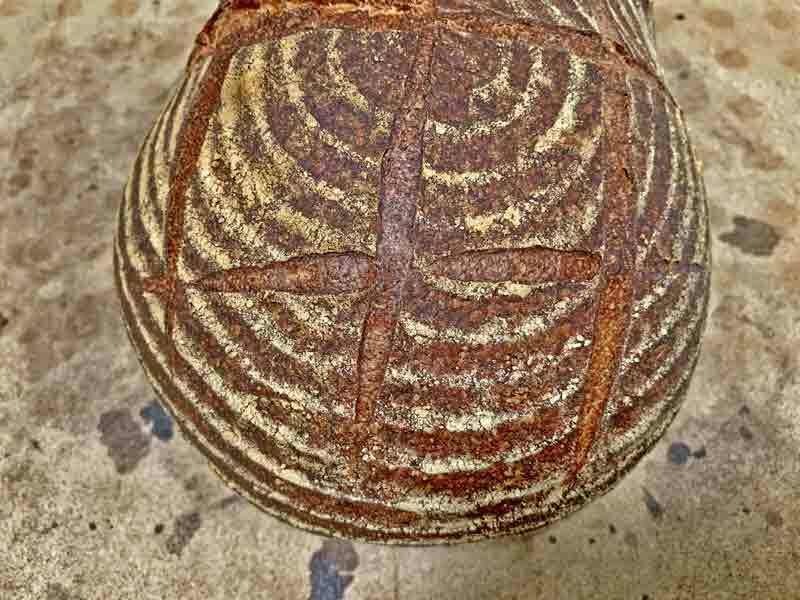 I think 10% rye is enough to enhance the flavor but not enough to significant effect the crust texture or crumb structure. I think dough hydration, steaming technique, and baking time and temperature are more important factors. For years, I have kept a "mother" starter at 50% hydration in the fridge. It is fed with a 70:20:10 mix of AP:WW:Rye. I generally feed it twice to adjust hydration and flour mix called for in the recipe and to jazz it up before baking with it. I mix a new mother every 3-6 weeks. I mix a total mother weight of 350g. This results in quite a lot of discard with each refreshment of the mother. For the current series of experiments, I mixed just 70g of mother and fed it 3 times per week with 70% high-protein white flour and 30% rye. This really cuts down on the discard. When I'm activating a starter for a bake, I use 60g of the mother to make 250g of starter and use the remaining 10g to mix a new mother - 10g mother:30g water:10g rye:20g high-protein bread flour. It seems to work nicely. David, you’re killing me! I love the look of that bread. Now I seriously have to do this one. Your SF versions have been inspiring. And I love that you have kamut in it. I love the crumb. It looks delicious! Thank you! and it would be so nice to be able to taste each other's bread! Using a 100% hydration starter with most formulas you get a feeling that it is normally up to 20%ish as a generalisation...I also understand that with firmer levains I need to up the water a bit and less flour in my overall percentages...and bear that in mind...but how about the allocation of LABS and yeast...in a liquid levain versus a firm levain? I generally use starters with about 20% of the total flour in the dough, whether using a liquid or a firm starter. Generally, liquid starters result in greater dough extensibility. That's desirable when making baguettes, for example. Firm starters generally favor more acetic acid production. For the home baker, in my opinion, the important thing is to be aware of the total amounts of flour and water in whatever starter you use so you know the true hydration of the final dough. In practical terms, the biggest difference is in the feeding demands - liquid starters are usually fed more often. This has different implications for a commercial bakery and a home baker. If you are baking once a week or less often, a firm starter may be easier to maintain. 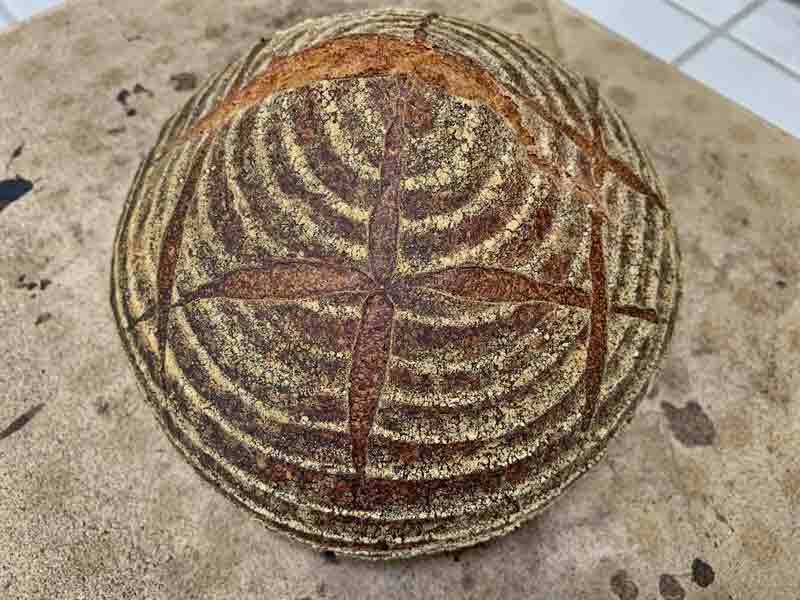 If you are a retail bakery and need to have fresh breads coming out of your ovens 3 times per day, a liquid levain gives you more flexibility - it ferments faster, and with more frequent feedings you can have your levain at the same stage of ripeness several times each day. Consistency in product is important. Your customers expect it. Your question isn't "silly" at all, but it probably doesn't make a big difference for us home bakers. 78% hydration. Lucy wants to do am overnight bulk on the counter at 72 F, say 8 hours to say 100% and then do a longish 24 hour shape retard to see what that one tastes like. Will drop it to 75% hydration to try and sow the bulk down on the counter. Lucy loves all the experiments you are doing and now she is jumping in too! That's some nice bread and it has to taste better than it looks! Well done and happy baking David. Looking forward to your results, dbm! This has been a productive series. I've learned .... or re-learned .... a bunch of things. sift out all the bran and get it all in there first and then use the HE flour for the rest of the 60 g in the levain at 100% hydration. Will use 12 g of NMNF starter to kick it off. Will do 2 hours of slap and folds and stretch and folds on 30 minute intervals and then let it bulk on the counter overnight for 8-9 hours at 75% hydration overall.